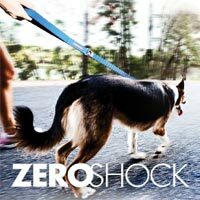 Browse to a photo of your pet. This item is made to order and usually dispatched within 14 working days. Delivery is a further 2-4 working days. 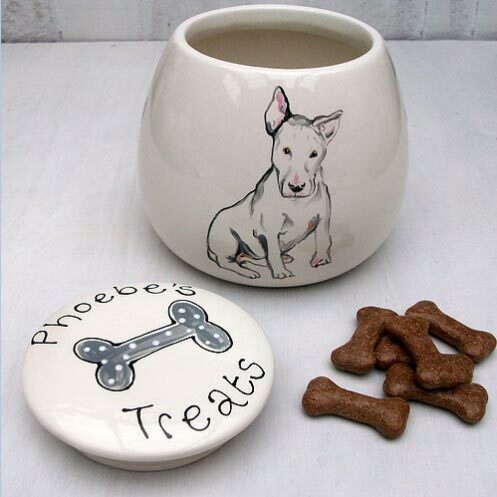 You may also want to add the portrait dog treat jar. 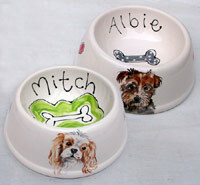 These personalised portrait dog bowls are beautifully hand painted in a UK pottery studio using materials from UK companies. 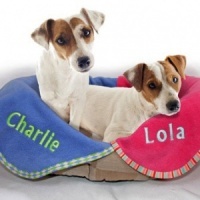 Fully personalised, they feature not only your dog's name but also their portrait. Stunning and completely unique. Either size can be used as water or dog food bowls. 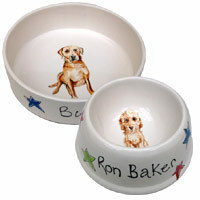 Simply upload your photo when you place your order and your dog's image and name will be painted on the bowl. No transfers or cheap shortcuts. Each bowl is carefully hand painted just for you. 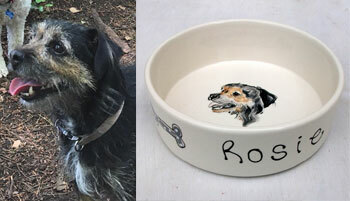 These bespoke bowls feature not only your dog's name but also a wonderful portrait representation of your dog from the photo you provide. The personalisation and gorgeous illustrations are hand painted onto high quality earthenware pottery which is then glazed and kiln fired at 1200 degrees producing a permanent finish which is also dishwasher safe. 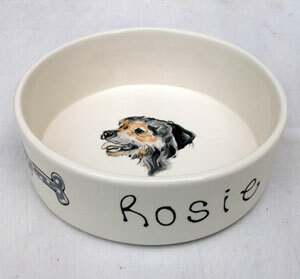 These customised dog bowls make the perfect gift that you won't find on the high street. 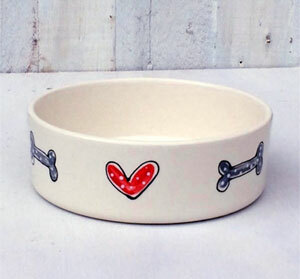 On the outside of the bowl features cute grey dotty bones and red hearts plus your dog's name. Inside is their very own likeness, hand-painted by the artist in her own wonderful style. All the designs are sketched and laid out before being hand drawn onto high quality bisqueware. The drawings are then carefully hand painted with a tiny brush and a steady hand onto the bisqueware using underglaze paints. The pottery is then glazed and fired at 1200 degrees in a kiln (not an oven) to ensure a lasting finish that will be dishwasher safe and will not fade or peel. These ceramics make wonderful gifts for dog lovers and dogs who appreciate fine dining. They appeal to all ages (and all dogs) and will be treasured for years to come. These straight sided bowls are a classic shape and great as a food or water bowl. Each piece of pottery is individually painted to order so please allow 14 working days to paint, glaze, fire and post the item to you plus 2-4 days for delivery. All pottery will be packed carefully with lots of bubble wrap to protect it. Please note that any accessories on the dog in the photo you provide will NOT be painted. Only the dog is painted - no accessories. 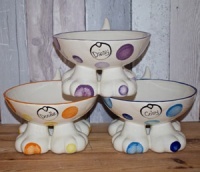 Beautifully crafted bespoke dog bowls, these make fabulous gifts for dog lovers! 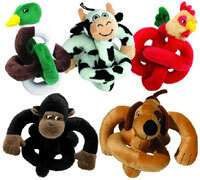 I ordered one of these for my poodle, Giovanni. It arrived today and it's absolutely perfect! The size of the bowl is just right for him, and the portrait is very cute, just like him. It also arrived very quickly considering that this is a personalised product. 5 stars, would recommend! I bought this for my brother. 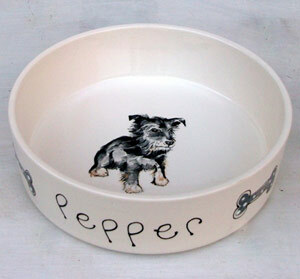 It is really lovely - such a nice idea to do really personalised bowls like this. It also came really nicely wrapped. The people at the website were very helpful helping me pick which photo was most suitable. My brother was thrilled! Surely any dog owner would be thrilled with one of these. I bought this as a gift for my brother and sister in law. They absolutely love it, so much that they think it is too lovely to use as a dog bowl and they are going to place it on show for all to see! The customer service was second to none right from placing my order, which I had a little trouble with due to my ipad but I was "talked" threw the process step by step via e mail and got my order in just in time before the Christmas deadline! The bowl arrived in plenty of time for Christmas and was wrapped very well indeed. I would recommend D for Dog to all my Doggy friends as they are a wonderful company who take the individual time to help and care about their customers. 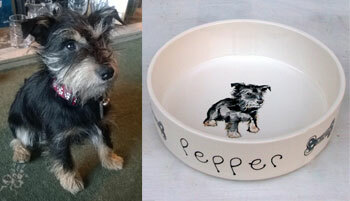 The bowl is beautiful and the likeness to Bella is amazing! Cant wait to get my own puppy and order a bowl for myself! Brilliant! Absolutely recommend 100%!! Ordered this for my little dog,Milly. Just love her portrait painting on the side. Perfect size for a dog bowl. Love everything about it.